This is a real honest-to-god hard-cover little book published by the Kern County Historical Society. I have no idea how it got on my shelves but in spite of the fact that neither Porterville nor the Tule River is mentioned, it was interesting in it’s own dry little way. There are plenty of black and white illustrations. I have a feeling it was originally some kind of masters thesis project because of the copious source notes and bibliography. The sources are usually local newspapers describing new stage routes and robberies. The Visalia Times Delta is a significant source. 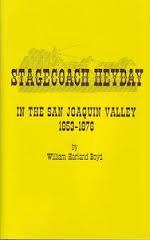 The book is organized geographically so that the routes from Visalia to the Bay Area are covered in one chapter while those from LA to Bakersfield in another. Stockton and Visalia were very busy hubs. It was a very busy time and Visalia was a very interesting place in the early days of this time frame with many locals supporting the South in the Civil War. All the destructive rains of those days was interesting to me as we don’t seem to have that kind of rain anymore. The time frame is from 1860 to 1871 or so. The trail near here, a Butterfield Stage route, is marked at a local restaurant with a little monument. We hold what is called the “Jackass Mail Run” annually and it always happens the stage (with mail from Porterville to Springville) is “robbed” – even a shoot-out in the streets of Springville.